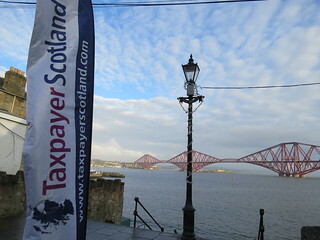 The TaxPayers' Alliance have joined TaxpayerScotland to bring the low tax message North of the border. After two days and 12 stops, the Scottish War on Waste Roadshow has drawn to a close. People across Scotland are rather fed up with the big government, high tax, high spending consensus, and were very supportive of what we were doing. But after 2 days on Scottish High Streets with weather described to me as "guy dreiche" I really am glad I brought thick gloves. Day one started off in Livingston, then carried on to Linlithglow and Coatbridge, before holding three separate events in Glasgow. We finished the day amongst the busy shoppers on Buchanan Street. We were joined by members of the Glasgow University Freedom Association - one of many free market student groups flourishing in Scotland. On our second day we headed out towards South Queensferry, before crossing the Firth of Forth and campaigning in Inverkeithing and Cowdenbeath. We carried on to Kircaldy but failed to catch a glimpse of the local MP, one Gordon Brown. Our stay in Glenrothes was cut short very abruptly. We were rather chased off by a man who insisted that the pavement was private land as it was owned by the council, insisting that we needed a permit. This is of course nonsense. The tour finished in Edinburgh, where we found our message immensely popular. The message that lower taxes and less spending are good for the Scottish economy interested many, but we had a lot of success in breaking the consensus that more spending meant more growth. There was certainly agreement that taxes were too high and people thought that much of their money was wasted. There is a lot of concern too about the new Land and Buildings Transaction Tax - Stamp Duty's bigger badder brother - which is already causing distortions in the market according to those we spoke to, as people rush to sell houses before it is introduced on the 1st of April next year. This new tax will hit anyone buying a property worth more than £325,000 and is causing a great deal of concern. You can find out more about it from TaxpayerScotland.